The marijuana industry continues to evolve and can now welcome a new ETF. This event could bring rise to new trends in 2018 for cannabis companies. 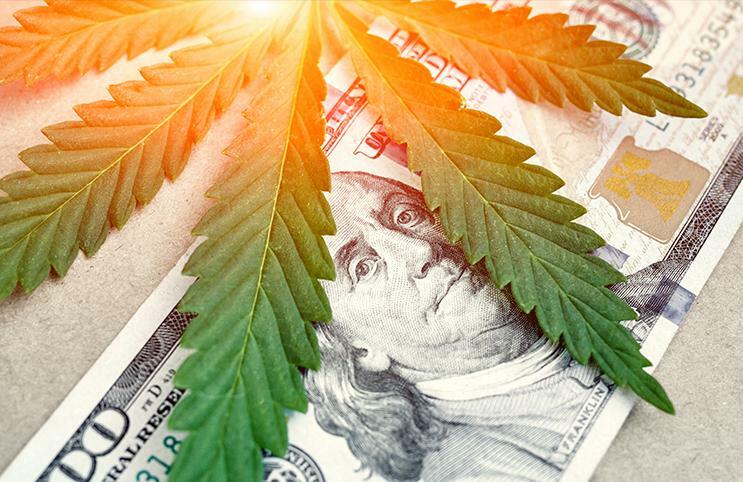 Those just getting their feet wet in dealing with marijuana stocks may or may not want to choose an ETF at first because risks are still present. Many opportunities have risen from the long list of marijuana stocks that have come about over the last few years. The early part of 2014 was a realistic tipping point for what had been building momentum during the years prior. Colorado legalizing recreational marijuana was the proof that other states needed in order to begin the domino effect that we know today as the green rush. But just because there has been so much success in the market (and failure for that matter), it doesn’t mean the rush is over. There are still states that have yet to enact marijuana laws and keep in mind that 2018 is the year that we see both California and the country of Canada “flip the switch” for fully legalized recreational marijuana. This having been the case, there is now the first US ETF going live that will focus on the industry. But there seems to be much more misnomer on the topic than actual analysis, to be honest. One article highlights a list of “potential stocks” to be included but anyone who remotely knows the space would quickly pick out the ones that have no business even being considered. Several have even taken a step out of the space entirely. So to really know where the opportunity may be with an investment into something like this, investors should really take into account a “lay of the land” of sorts. Next year looks like it could be a tipping point for the cannabis industry. Not only will we see Canada going full recreational but you also have California widening its budding roots for its recreational marijuana marketplace to go live. 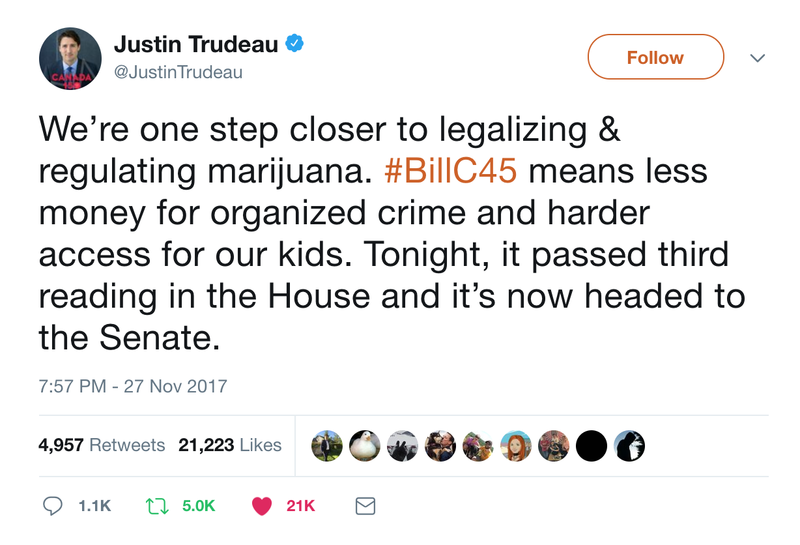 Justin Trudeau, the Prime Minister of Canada, seems to be very bullish on the subject. He recently tweeted his optimism surrounding the opportunity that legal cannabis could bring to the country. The main focus for many has been on two distinct segments: 1. Cultivation, and 2. Health benefits through applications of CBD. Canada, for instance, has seen an explosive interest from investors with companies like Canopy Growth (TWMJF) and Aurora Cannabis (ACBFF) expanding their footprints across the globe. Canopy Growth, on the other hand, has basically been its own catalyst to the latest move for most marijuana stocks. Beverage juggernaut Constellation Brands (STZ) made a multimillion-dollar investment into the company with a 9.9% stake. This could not only mean a turning point for the industry in general (this is the first mainstream company to really make a point to show interest with such an investment), it could also mean a turning point for the beverage industry as well. Of course, we have yet to see what the outcome of this investment will yield for either company beside equity and cash, but time will surely tell. This trend doesn’t just stop with these investment deals either because 2018 could see growth in exports as well. Aside from Aurora and Canopy Growth, Aphria (APHQF) has joined the party when it comes to cannabis exports. They’ve been given the “OK” to export dried cannabis to foreign markets. This includes places like Germany, which has legalized medical marijuana and has only low levels of domestic growing capacity. Recent attention on Medreleaf (OTCPK:MEDFF) could also point out another key to what 2018 might bring as far as market growth. Not only is the company a cannabis producer, they are ISO 9001 and ICH-GMP certified to produce medical cannabis. Standardization and consistency has been one of the issues faced in when it has come to growing cannabis. A universal quality control system is what has been lacking in the market in general and though there is no standard of testing quite yet, this may be something that comes up during the new year as many companies will be increasing their cultivation capabilities to meet new demand. Though ISO 9001 does now define the actual quality of a product, it does allow companies like Medreleaf to achieve more consistent results in order to improve the process. Other producers include companies like Emerald Health Therapeutics (OTCQX:EMHTF), which also has a crossover into the medical segment of the marijuana industry. Further acceptance of cannabis as a viable means of medication may continue to grow in 2018 as well. Emerald aims to have over 500,000 square feet of cultivation space built at its new Richmond, BC site by the end of 2018. Emerald further has entered into a 50/50 partnership with Village Farms. The partnered companies will convert an existing 1.1 million square foot greenhouse in Delta, BC from growing tomatoes to growing cannabis. As is the case with any industry, an investment into a basket of stocks versus investing into individual issuers has its ups and downs but the marijuana industry itself may be unique. One of the biggest differences is that most of these companies aren’t traded on any major exchange. The risks of investing in small cap companies are one thing but now investors will see a fund that more than likely will have a large collection of stocks known as penny stocks. These have their own inherent risks and when you also throw in the lesser reporting requirements of Over The Counter companies, strict due diligence is paramount for investors. Now, we’ll see an entire fund dedicated to investment into higher-risk stocks so investors should be ready to stomach a potentially higher level of market change for this particular ETF. The ETF itself isn’t necessarily new either. The Tierra XP Latin America Real Estate ETF (LARE) currently tracks companies that have some kind of involvement in Latin American real estate. This will all change as it has filed to change the focus of its holdings to now track cannabis companies. The new fund will be known as the Alternative Agroscience ETF and is expected to begin trading sometime this month. This will then bring exposure to cannabis-related companies, which focus on legal cultivation, production, and distribution of products for medical or non-medical applications. And just like Canada is acting as litmus for national legalization, the country may have already produced the framework for what’s to come in the ETF space. The first cannabis-themed ETF debuted earlier this year on the TSX. The Horizons Marijuana Life Sciences Index ETF has been very popular on the exchange and has compiled over $150 million is assets. The last 90 days have also shown a positive move in the market as well with a gain of more than 30% in market value during that time. The Alternative Agroscience ETF, “will not invest in any companies that are focused on serving the nonmedical marijuana market in the United States, Canada or any other country unless and until such time as the production and sale of non-medical marijuana becomes legal in the United States, Canada or such other country, respectively,” as written in its filing to the SEC. So as far as companies in the US that are non-medical related, investors should be able to quickly sift through the list of marijuana stocks that won’t make the cut. 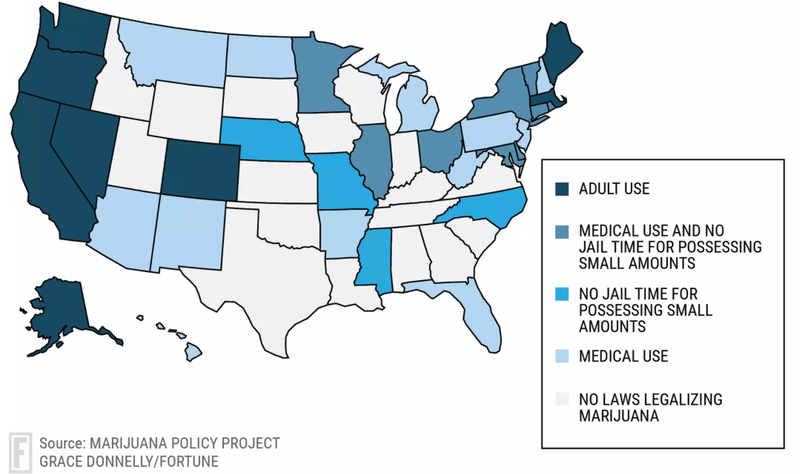 This begs the question of, “when will cannabis finally be universally legalized in the united states?” The answer is unclear as of now but the US may be getting closer. New initiatives from key leadership like Elizabeth Warren as well as events like the introduction of a bill that proposes that active duty soldiers be allowed access to experimental medications, which include medical marijuana, means that the conversation is getting louder in Washington, D.C. Right now, there are 29 states and the District of Columbia that have legalized medical marijuana. Eight states along with DC have also legalized recreational marijuana, with Maine still being in a bit of volleying with legislation right now. In addition to this, it’s important to note the growth in states like California, with an estimated $50 million in tax revenue per year, aren’t expected to slow down anytime soon. But these figures still pale in comparison to the black market. There were roughly $6.9 billion in legal sales in North America in 2016, but Arcview estimates that $46.4 billion were conducted on the black market. Further taxation and legislative support should help reverse this instance as more states and countries simply legalize the drug. With the global medical marijuana market projected to reach $55.8 billion by 2025, the addition of an actual ETF could be a sign of the times that Wall Street is ready to see a true green rush.